The Rottweiler is known for being a very loyal pet. When you leave the house, it is not uncommon to find that your Rottweiler is barking and visibly upset. They may even destroy your home while you are gone, even if you are only gone for a few minutes. I understand that this is incredibly frustrating. You may find that they are scratching at the doors or windows, chewing up the furniture, and maybe even urinating or defecating on the floor in your absence. These are all common signs of separation anxiety. I would like to take some time to explain the possible causes of separation anxiety, and then we can discuss some solutions. Your Rottweiler doesn’t mean to act out while you are not home, but sometimes they just cannot help themselves. We must be understanding with them. If we can get to the root of the problem, we can try to fix it. If your Rottweiler is a new addition to your family, this may be the cause of their separation anxiety. They are in an unfamiliar setting, and they may even be afraid that you are not going to return. Especially if you have recently adopted them from a shelter or another family. We must be understanding of our pets. They don’t know why we are leaving, or when we are coming home, so it is common for them to get anxious when we leave them behind. Your Rottweiler may be acting anxiously when you leave due to a sudden change in your schedule. If you have recently changed jobs and now you work different hours, this change in schedule can affect your dog’s peace of mind because it changes their schedules as well. They may be accustomed to you leaving the house in the morning and coming home in the afternoon. They understand that when you leave in the morning, you will not be returning for several hours. But now you leave in the afternoon and return in the evening. Your Rottweiler doesn’t understand this concept, and it will take them a little time to adjust to your new schedule. 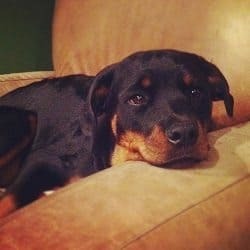 If you and your family have recently moved into a new home with your Rottweiler, they may get anxious when you leave the house because they are in a new house with new smells and a different set up. Change is something that takes time for a dog to adjust to. They may be scared that you are not going to come back. They may be worried that you will get lost on your way home. What ever the reason in the dogs head, being in a new home can certainly be stressful on your Rottweiler. If you have had a change in your family members, this can also cause separation anxiety in your Rottweiler. If there has been a death in the family, or a member has moved out, this can be a confusing situation for your loyal dog. They do not understand that someone has died or moved away, they may still be waiting for that member of the family to come home. The dog may act out when you are gone because they do not understand why this certain member of the family is not returning home. 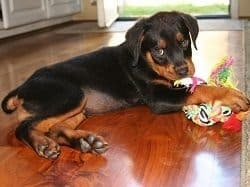 Since the first 40 minutes of your absence is when most of the destruction is generally done, to help ease your Rottweilers anxiety, try giving them a toy filled with peanut butter, cream cheese, wet dog food, or kibble before you leave. This will give the dog something to keep them occupied for several minutes, and they may forget the you have left, therefore easing their anxiety. If they get anxious when you are preparing to leave, try easing that anxiety by making the process of putting on your boots, coat, or grabbing your keys result in not always leaving the house. Try putting on your boots and grabbing your keys and just sit on the couch and watch television. Always remain calm when leaving and reentering your home. If you make a fuss about leaving, this will trigger your dog to become anxious that you may not return. Just leave without acknowledging them, and when you return, enter quietly. Try leaving the television on if you are only going to be gone for a short period of time. If you always turn it off when you go to work or leave for a long period of time, they can associate you leaving the television on with a quick return by you. 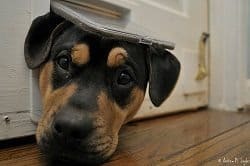 Finally, never hit or yell at your Rottweiler if they have destroyed your home in your absence due to separation anxiety. This only adds to their fear and anxiety. Just give them the silent treatment when you come home, clean up their mess, and be understanding and patient with them. They don’t want to be destructive while you are gone, so if they have something to keep them occupied in your absence, they will be a lot happier, calmer, and less anxious.